Yardley's note of thanks for the 25th anniversary calendar. Margaret Stewart thanks Miss Berry for the beautiful anniversary calendar. 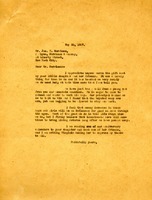 She encloses Professor Lloyd's letter and a $5 contribution. 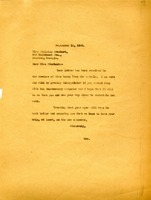 Mrs. Harriet C. Moore informs Martha Berry that she has received the anniversary calendar. She also sends a $150.00 donation to the Berry Schools. 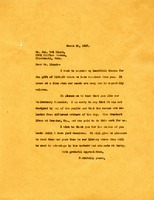 Miss Berry thanks Mr. Lloyd for his donation and answers his questions he asked in a previous letter. 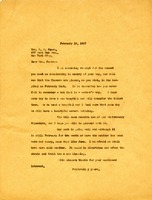 In this letter Martha Berry is thanking Mr.Harrison for the gift brought by his daughter and friends. She also shares the story of the boy with one arm who wants to come to school and work. Mr. Noble writes that he has just received the very pretty "Twenty-fifth Anniversary Calendar" from The Berry Schools. He feels he must visit the places illustrated. Martha writes to Mrs. Fearn with a receipt for the amount she sent in memory of her son, and will see to the hospital flowers on the 21st of February. She also informs her she will receive one of the Anniversary Calendars soon. 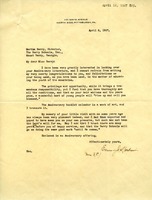 Letter from Emma J. Harbison to Martha Berry in response to anniversary literature. 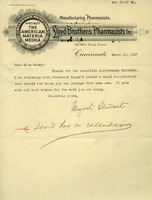 In this letter, Martha Berry's Secretary asks if Miss Everhart's eyes will be better in time to help with the Anniversary Calender.